We’ve done most of the usual sports over the years, some for just 1 or 2 seasons and some that have clearly become life-long activities: t-ball, soccer, basketball, lacrosse, volleyball, gymnastics, football, karate…even a few tennis and golf lessons last summer. 1. PLAYING TIME–In swimming, everyone participates. No one is stuck on the sidelines. 1A. A DIFFERENT DEFINITION OF WINNING–We are all about the ‘personal best.’ Our summer coaches even award a ribbon every time a swimmer breaks his own best time in an event. So we never worry about whether our son or daughter comes in first or last in an event. Instead, success = taking time off. With this approach, a last-place finish that sets a personal best is a much bigger accomplishment than a first place finish that is slower than the seed time. The opponents that matter most are the clock and your own best time. My 8 year old’s abs put a G.I. Joe doll….er….action figure…to shame. His secret? 2 hours of practice per week during the school year, 5 hours of practice per week during the summer season–plus swim meets. After 8 years of summer swimming, his 16 year old sister has at least 10 more pounds of muscle than she would have. Always very thin, instead of resembling one of those skeletons that hang in a science classroom she is now strong enough to play high school varsity and travel club volleyball. Their 13 year old sister swims 100 and 200 meter events. Then she grabs a drink and a quick snack before competing in her next event as soon as 30 minutes later. 4. THE POOL–AGGRESSION FREE ZONE–In most sports, kids learn–and sometimes are coached–to use aggression to offset someone else’s superior skill. In swimming, the lane lines give each swimmer her own space, and the only thing that matters is speed. Swimming doesn’t necessarily favor the big…and there is no opportunity to be rough: Swimming rewards the fast. 5. 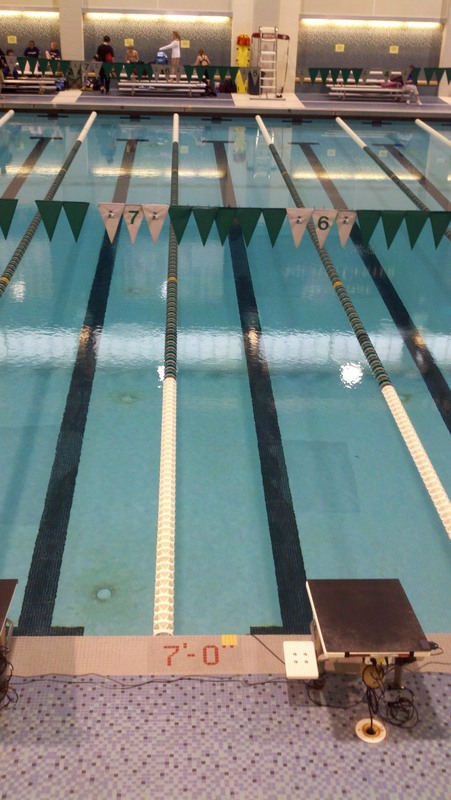 BALANCING TEAM AND THE INDIVIDUAL–Swim meets are team competitions, and kids and their parents cheer their fellow Dolphins, Dragons, Sharks, or Seahorses. At the same time each swimmer can earn a personal best or a place ribbon, usually in 3-4 different events. in one day But there is no conflict between team and individual goals: Swimming is the rare team sport in which an individual pushing solely for his own success cannot hurt the team’s performance. 6. SAFETY–Because there is no physical contact between players or with any hard surfaces or equipment, injuries–beyond the occasional strained muscle–are rare. In swimming I enjoy watching my kids train and compete without any worry about sprains, broken bones, or concussions. 7. A SPORT FOR ALL SEASONS–The summer (June-July) outdoor season and the winter (September-May) indoor season combine to give kids the opportunity to train and compete for up to 11 months out of the year. Thank you for visiting my blog. Sorry you’re having trouble w/ the images. So far no one else has mentioned a problem, and they open for me at home, at work, and on my smartphone. Hope this is helpful. Take care.